T his is an October song that I enjoy every fall with young children. The tune is at this link. October, October, leaves orange, green, red, yellow, brown. October, the wind blows. Leaves falling down, down to the ground, leaves fall down to the ground. With its ¾ meter, this is a fun song to encourage swaying, graceful movements in a waltzing style. Fall-colored scarves can be a good addition. Before singing the last “leaves fall down to the ground,” you may stop and ask for children to create a big gust of wind. They might say “whoosh!” and then throw their hands over their heads. October, October, the red leaves are all around. October, October, leaves fall down to the ground. Repeat the song with each of the other fall colors. You can add a visual with different colors of leaves. Point to each color and ask children to help identify the color. 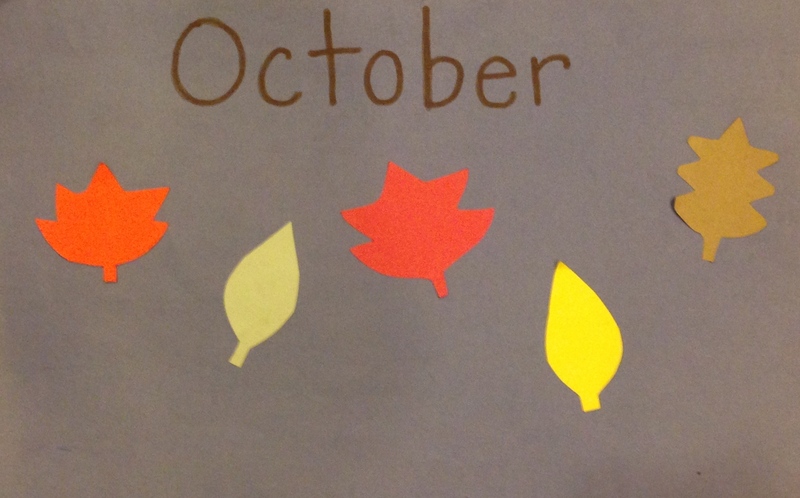 After children are familiar with the song, give out fall-colored scarves and invite them to do standing movements. Throwing the scarf in the air and letting it fall is fun at the end. On another note: here is a fun finger play, a perennial favorite. I first learned this song from my mother, who volunteered to teach music at a school in Washington, D.C. many years ago. I don’t know the author, but I added the ghost! Three little pumpkins, lying very still, in a pumpkin patch on a great big hill.